Local authorities are launching a criminal investigation against a Gurnee Dodge employee, after an owner recorded one of the technicians allegedly taking his 2008 Dodge Caliber SRT out for a “joy ride” that reached speeds near 100 MPH. According to the DailyHerald.com, Drew Hovorka took his Caliber SRT into the dealership for a 100,000 mile maintenance service. 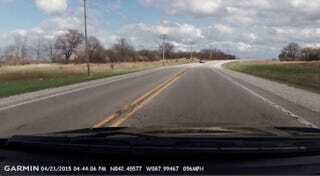 He had a Garmin dashcam installed in the car that automatically turns on when the vehicle is in motion. After Horvka got his car back he watched an eight-minute video that shows one of the technicians taking his car out on public roads and getting up to 96 mph in a 50 mph zone. Authorities have identified the mechanic that was driving and said he has refused to answer questions about the incident. Gurnee Dodge general manager Todd Thommes and dealership President Michael Fohrman were also unavailable for comment when the Daily Herald contacted the dealership. Drew’s wife Christine Hovorka said the video will make her rethink where to bring their car the next time it needs service.